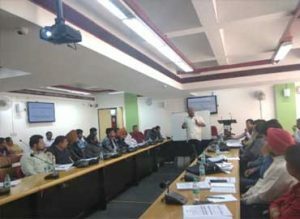 Mr. Ajay Sinha, CEO, Feedback Foundation was invited by Mahatma Gandhi State Institute of Public Administration (MGSIPA) at Chandigarh to take a session on ‘End to End Waste Management’ in a Capacity Building Programme for officials and elected representatives of Urban Local Bodies (ULBs) of Punjab and Haryana. Mr. Sinha shared the complete array of waste management solutions and the issues in Waste Management. Various policies and rules on Solid Waste Management were also discussed in brief. There were 40 participants from various ULBs in the workshop at Convention Centre of MGSIPA on 20th November 2018.